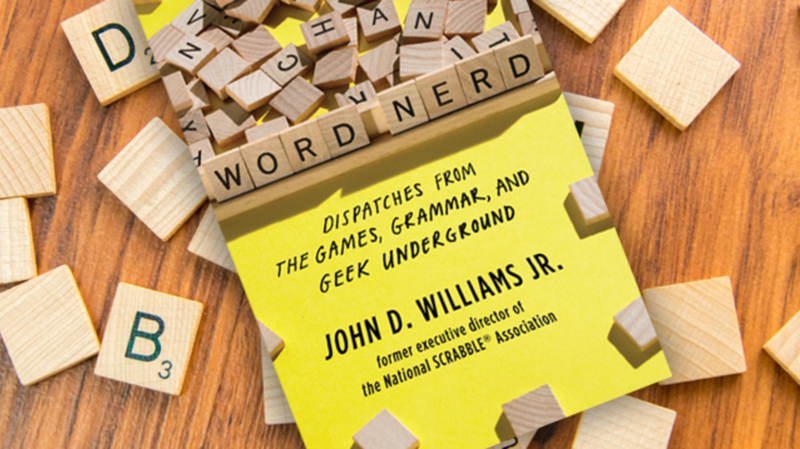 Word Nerd: Dispatches from the Games, Grammar, and Geek Underground, by John D. Williams, is a merry exploration of the intriguing, eccentric, and sometimes brutal world of professional SCRABBLE play. Few are better qualified to tell the story than Williams, who was a key figure in establishing the World Scrabble Championship, and who helped move the game from living rooms to ESPN. Here are seven things Word Nerd reveals about the pitiless game of Scrabble. 1. Scrabble is the one time when you hope the NSA is listening. The National Scrabble Association (previously, Scrabble Brand Crossword Game Players, Inc.) was responsible for oversight of hundreds of official clubs dedicated to the game; scheduling tournaments and tracking player ratings; and promoting the game in general. Perhaps its most visible role was in maintaining the Official Tournament and Club Word List—the words considered fair play in the game (which sometimes differs from the Scrabble dictionary, especially as it relates to profanity, which is officially allowed; if you can think it, you can probably play it). Today, the NSA is organized as the North American Scrabble Players’ Association. 3. Facebook has complicated the creation of words. As Williams explains, there’s a long journey before a word becomes a word. It begins with “reading and marking,” in which dictionary editors scour magazines and journals ranging in quality from The New Yorker to People. They are searching for “good examples of words used in context.” New words, new inflections, and new spellings of old words that are discovered are entered into a citation database. Once a word logs enough usage, it becomes eligible for consideration by dictionary editors. (A word’s reach is long; the database has been going for over a century now, and contains more than 16 million words.) The growth of social media has complicated things. Words proliferate at a much faster rate; where they generally had a dictionary inclusion lag time of 10 to 20 years, words are now formalized in as few as five years. Through the second edition, the Official SCRABBLE Players Dictionary contained profanity and racial slurs. “After all,” Williams writes, “lexicographers cannot pretend a word does not exist just because someone doesn’t like it.” When the Anti-Defamation League accused Hasbro of “playing games with hate,” the company’s CEO capitulated and ordered the dictionary scrubbed. Deleting words, however, isn’t as easy as one might think. What is a slur, after all? Aside from the obvious ones, lexicographers explained that such words as “Jesuit” (“a scheming person”) and “papist” (“a Roman Catholic”) were considered slurs for centuries. Likewise, a word like “welsh,” which has “the same connotation as ‘Jew’ used as a verb.” To the outrage of many, the third edition of the dictionary removed roughly 175 “offensive” words. A compromise was reached with the National Scrabble Association, allowing the purged words to remain in official play by establishing the Official Tournament and Club Word List. 5. Hollywood is a mixed bag. Jack Black is a confirmed Scrabble devotee, as is Martha Stewart, who joked that while in prison she had a lot of time to improve her game. Jimmy Kimmel has won charity tournaments, and every year invites the winners of the National School Scrabble Championships onto his show, where he plays against them on television. (He plays to win, vowing not to stop “until every child in America has been destroyed.”) It’s not all good news in Hollywood; Scrabble players were disappointed by the movie The Wedding Planner, whose depiction of Scrabble tournaments was connected to reality only in that tiles were used. 6. Scrabble tournaments are serious business. Williams describes professional Scrabble players as a cordial bunch, but as intense as the athletes of any sport. By the game’s peak in 2004, the National Scrabble Championship had grown from 32 players to over 800. That kind of meteoric growth is going to include some eccentrics, from the champion who practices tai chi between rounds to the experts scoffing at the “lesser” competitors “playing up.” The winner of a national championship will take home $10,000 and possibly end up on television morning shows. Outside of the national and world championships, however, the game can be taken just as seriously. The National Scrabble Association once received a letter from a prison inmate asking for an Official SCRABBLE Players Dictionary. It seems a dispute over the admissibility of a word resulted in an inmate being stabbed in the eye with the pencil used for keeping score. 7. The Internet ruined everything.